Bryant H. McGill said, “One of the most sincere forms of respect is actually listening to what another has to say." It’s not just a form of respect though, to be heard and understood is a basic human need. One of the Gallup G12 questions to survey employee engagement is “At work, do your opinions seem to count?”. But in order to hear and understand, you have to be really listening, not just looking interested. How often during your day are you really listening, and what exactly does really listening mean? Not listening: The lowest level of all. At this stage, you are ignoring or not paying attention to communication at all. This has happened to me when I was multi-tasking on a conference call. Suddenly, I realize that I have passed through the higher stages down to actually focusing so much on a task in parallel that I’m not listening at all anymore. Pretend listening: At this stage, you are giving the impression that you are listening, but you aren’t paying attention at all. It’s possible to look right at a person and watch their mouths move without hearing a word they are saying. Often, we do this because we are listening to something in our own head instead of the speaker. But you also might be distracted by someone or something other than the speaker. Partially listening: The next level of listening is partial. Basically, you are listening to some of what the person is saying, but you’re only giving it your divided attention. This can happen when you are listening selectively. Perhaps you’re daydreaming and waiting to hear a key word for a topic coming up on the agenda that you are interested in. Or your listening idly, to get a general idea of what’s being talked about. Focused listening: Moving up the scale in listening intensity, focused listening is, in principle, undivided in the sense that we are not focused on anything outside the conversation. However, at this stage, we are often listening to respond. So we are not only focused on what the person is saying, we are crafting our response in our heads while they talk. This is a stage a lot of people get stuck in. Stephen Covey said “"Most people do not listen with the intent to understand; they listen with the intent to reply." Interactive listening: When you not only listen, but listen to learn, you make sure that you understand by asking clarifying questions. Interactive listening provides the opportunity to verify understanding and leave the conversation with a better understanding of what the person meant. Engaged listening: Finally, we come to the ultimate level of “listening”. When you not only validate your understanding, but have an exchange about your own perspective, the exchange is at it’s richest. Each party has the opportunity to express their views, feelings, and ideas. 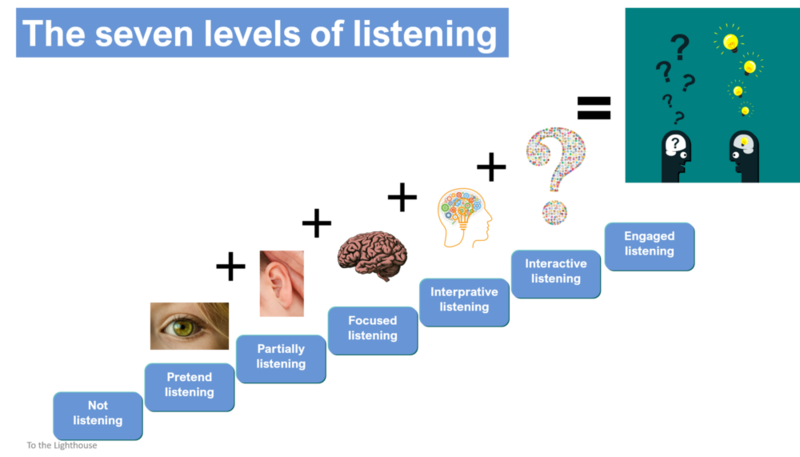 In order for someone to really feel heard, the listener needs to be at least the interactive listening level. It’s impossible to know if someone who listened but provided no context for what they heard really understood. Here are a few things you can do to ensure that you are really listening. Clarify – see clarification by asking questions. Questions are most effective when they are open ended (not yes or no) . And when they are used to gather additional details. That concludes this 3 part blog series on Effective Communication. Look out for future blogs on similar topics like effective emails and the importance of word choice. Want your team to learn more about effective communication? Contact me about Team Talks or a training workshop.